It’s always a wonderful thing to climb a mountain in Idaho and enjoy the spectacular, 360-degree view. But normally, it’s a fleeting moment on top before it’s time to return to the trailhead or your base camp. 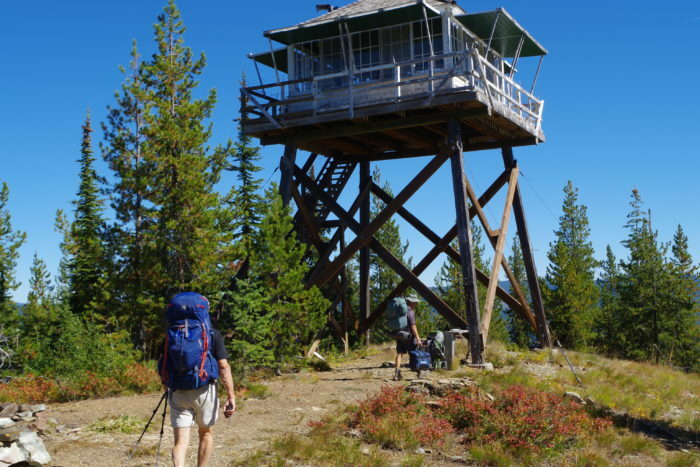 But what if you could camp on top of the mountain, stay in a fire lookout tower and enjoy the view for several days? The U.S. Forest Service thought they’d give that a try a number of years ago, and it turned out that camping at lookouts would prove to be very popular! 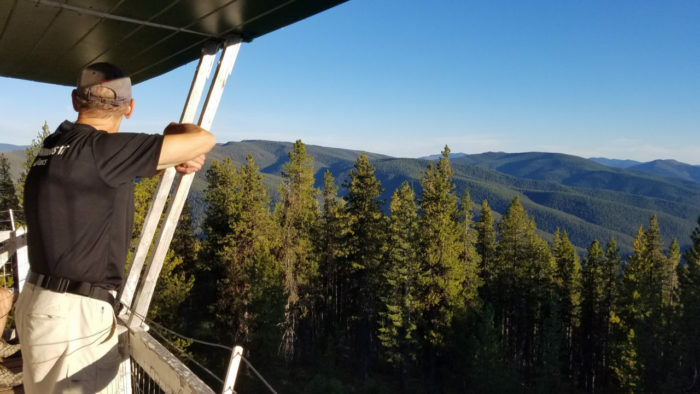 Several years ago, I was inspired to camp at a lookout by an Outdoor Idaho television program called “Eyes of the Forest: Idaho’s Fire Lookouts.” I was particularly interested in reserving a lookout tower, the kind that are built on “stilts,” you might say, to provide the best possible view of the surrounding countryside. Most of the lookout towers in Idaho are located in northern Idaho, where the trees are so dense that the lookouts need to be greatly elevated to see the surrounding area. The views are endless atop a fire lookout. Photo Credit: Rick Gerrard. Idaho has about 10-12 lookouts available for rent through recreation.gov. Last spring, I reserved a two-night stay at Arid Peak Lookout in St. Joe River country, near Avery, Idaho. The lookout was booked all summer long! I took the first available dates in September. Arid Peak Lookout is different than most because you have to hike in about two miles to reach the tower. The hike in made the trip a little more arduous and adventuresome, which was fine with me and my friends, Rick Gerrard and Mark Young. We used backpacks to carry our personal belongings to the lookout, and since it was only 2 miles from the trailhead, we took turns carrying a lightweight soft cooler with plenty of ice and drinks. On Day 1, we planned to hike in, get situated, and stock up with water from a spring about half a mile away on a steep downhill trail. On Day 2, we planned to do a 6-mile side-hike over to another peak nearby, and hang out on the mountaintop, enjoying the view. Grab your pack and head out for a hike with amazing views. Photo Credit: Mark Young. Arid Peak Lookout is located at about 5,400 feet elevation (tall by north Idaho standards), with a strategic view of the old Milwaukee Road rail line. The lookout was built in 1935 to watch for fires sparked by the railroad. The railroad line did not last long as other routes were selected for long-term use. Later, the Avery Ranger District worked to create the Route of the Hiawatha bicycle trail on the old rail line, which has multiple tunnels and trestles. The 13-mile trail is located very close to the trailhead for Arid Peak, so folks could plan to ride the Route of the Hiawatha as part of their trip. Jamie Schmidt, whom I met when the Route of the Hiawatha was opened to biking, served as the recreation and trails staffer for the Avery District. She also spearheaded a project to restore Arid Peak Lookout for public use in the mid-1990s. Scores of volunteers helped refurbish the lookout, replace wooden structure beams and supports, and make it safe for rental customers. We appreciated reading about all of this work in the selection of books and reading materials supplied at the lookout by the Forest Service. Similar restoration efforts are being done across the state by the Forest Fire Lookout Association to make fire lookouts available for public use and to preserve the history. Kudos to them. Idaho at one time had more forest fire lookouts than any other state in the nation – more than 900 of them. As the name implies, the lookouts were built to give Forest Service employees a high vantage point to watch for fires and then report them to the local ranger station. Today, a number of the lookouts in Idaho are still being used for this purpose. The View – I thoroughly enjoyed looking south into a seemingly endless carpet of green trees in the St. Joe National Forest, in particular. Thinking back to the 1910 fires, all of that area had burned, and the new forest is tall and thriving, some 100 years after that horrific event. 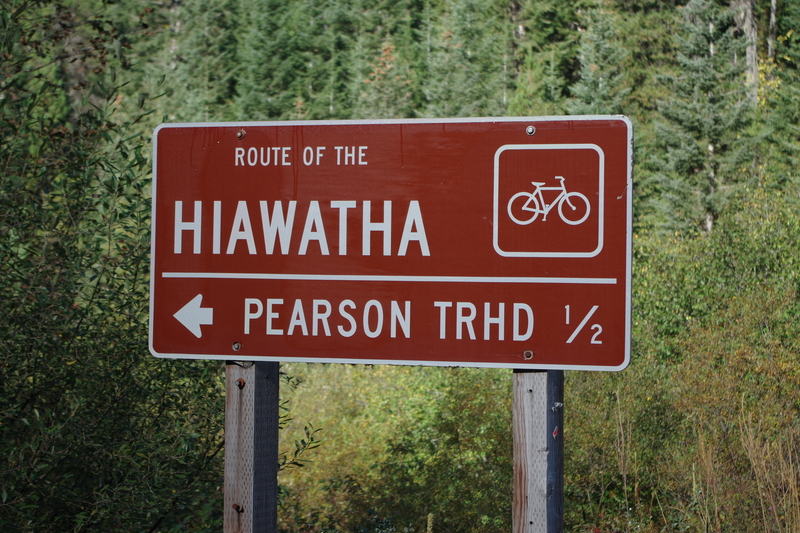 I also enjoyed looking at the surrounding peaks and the Route of the Hiawatha railroad grade, thinking about many fun times riding through those chilly dark tunnels on my bike. The Quiet – During the middle of the week, the area was amazingly quiet. We naturally tuned into nature, listening to ravens chat in the trees, songbirds, the wind whipping through the trees, and the stillness of the wilderness. 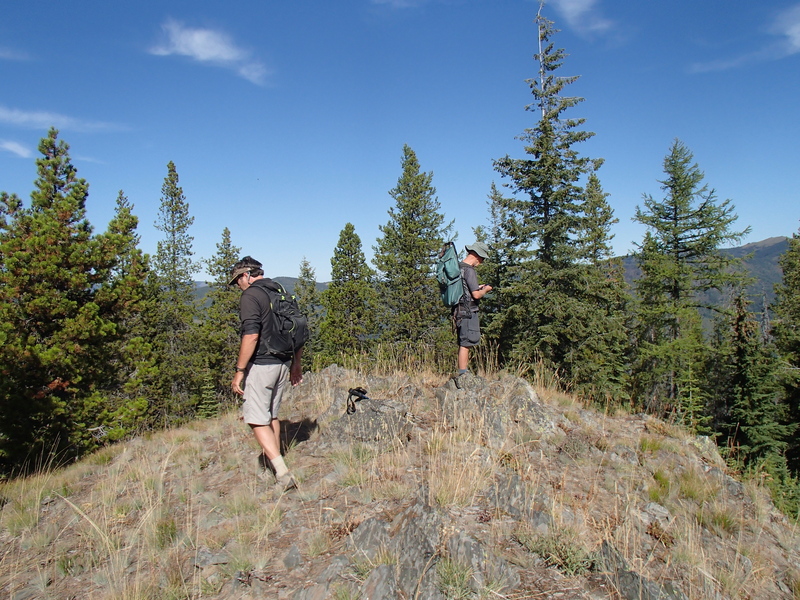 The Hike – It’s so different hiking in the tree-covered ridgetops of northern Idaho than in the wide-open airplane views found in Southern Idaho…here you can’t see much except the forest around you. So it’s fun to look for animal tracks, see the diversity of plant life and tree life, and watch for wildlife. We saw elk and deer tracks, but only saw Franklin and blue grouse. 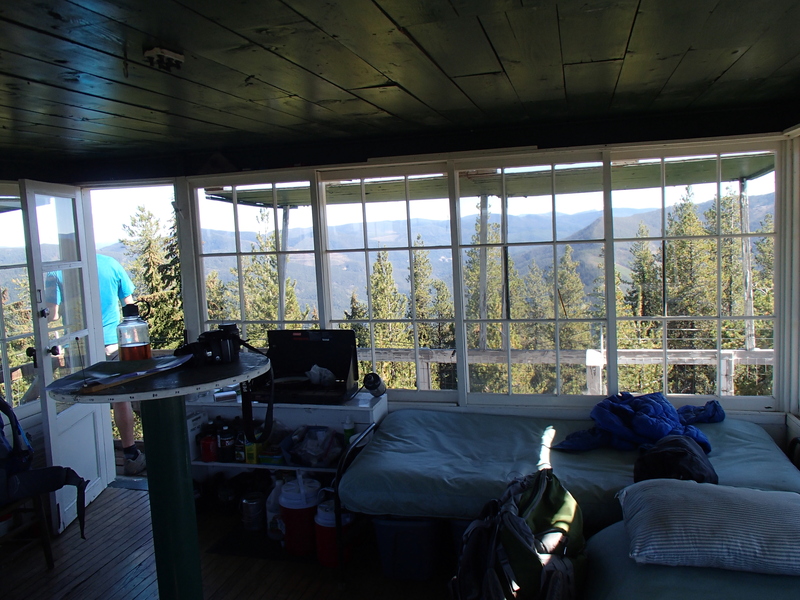 Creature comforts – Staying in the lookout tower, you get to sleep on bunk beds (bring your sleeping bag), and it’s stocked with pots and pans and a double-burner propane stove. Just bring food, water and propane flasks, and the rest is all there to enjoy. 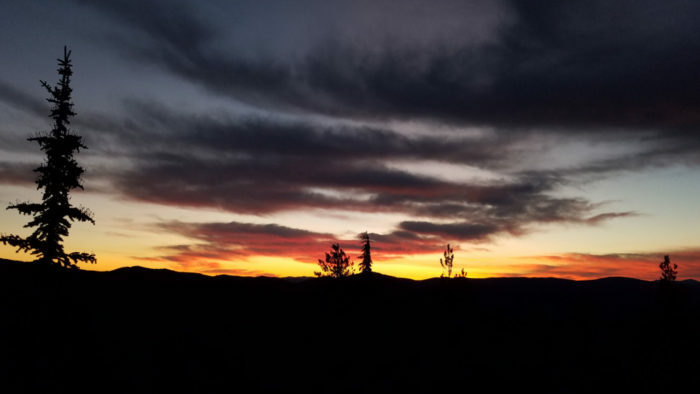 Enjoy views for miles from inside in the fire lookout. Photo Credit: Steve Stuebner. Capping off our experience, we were treated to a nearly full moon the first night, and a full moon the second night. We made a campfire at the base of the lookout and watched the big moon come over the mountain tops and brighten the landscape around us. A magical moment, indeed! Sweet dreams and relaxing nights. Photo Credit: Rick Gerrard. Bruce Reichert, Outdoor Idaho executive producer, called Idaho’s lookouts “doorways to heaven, sanctuaries at the edge of the sky.” I couldn’t agree more. 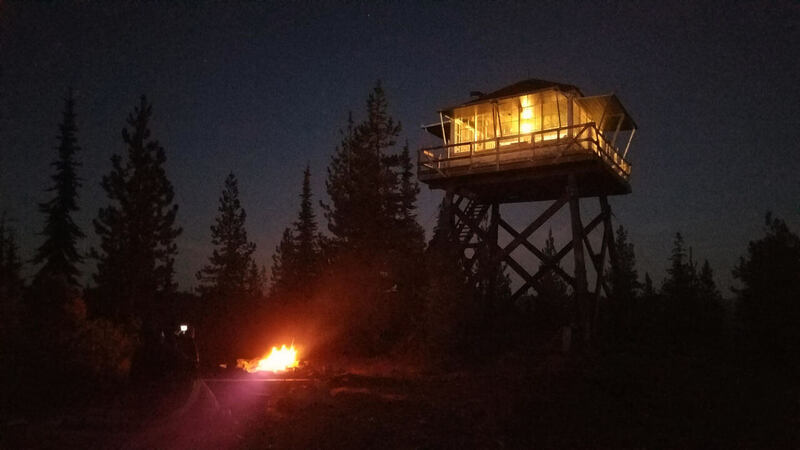 To rent a fire lookout in Idaho, go to recreation.gov and search for a specific lookout you’d like to rent or see what’s available. Plan ahead and make your reservations early. They are popular! In some cases, like with the Arid Peak Lookout, you’ll need to do some hiking to reach the lookout. In other cases, you can 4WD all the way up to the lookout you’ll be camping in. To learn more about Idaho’s fire lookout offerings, check out Idaho Public TV. Steve Stuebner is a widely published outdoor writer based in Boise. Read more at http://stuebysoutdoorjournal.blogspot.com.